While scrolling down the Spring 2016 anime list I encountered Tanaka-kun is Always Listless. It seemed like an anime with no presence and no one would've cared about it. The anime is actually really good overall and people started noticing it because it was actually good. I feel this is really underrated because of the unusual synopsis and such. The story is about Tanaka and his friends around him, basically like the usual high school girl with the conflicts with the outside connections between the main MCs. This is the lowest point because, it is extraordinary in a way but the plot didn't really get to me. The story is cute though so it's okay. The art backgrounds were very beautiful in my opinion. Character designs were unique in a way. I really liked the art for Tanaka-kun for some reason, what a relaxing sight. I love the characters so much. They are so different from most other anime characters which are bold with no intentions at all. Basically they all have a reason for acting the way they do. This doesn't seem to be a anime with character development but it still does. Overall I give this a 9 and I enjoyed this very much. Please give this underrated anime a try! This is an anime that was FULL of potential. I started it without many expectations, but the first two or three episodes managed to raise them, and make me think of this as the possible gem of the season. From summaries and reviews, one might be thinking Tanaka-kun defies mainstream narrative clichés, and that the overall product tends towards a certain general calm feeling. The truth is: Tanaka-kun had the potential to be that. It had the potential to tell an entertaining, relaxing, non-stereotypical story, while having an upbeat general tone and characters. Then it became... something else. There were a lot of harem hints, and a lot of moe that didn't really add anything of value to the story, and also a lot (A LOT) of unnecessary emphasis on the romantic feelings from one of the characters towards Tanaka. I feel like Tanaka-kun dropped the ball. It could've been something incredibly engaging and somewhat original, but instead it chose to be... basically the same as the 1000 harem, school life anime that came before it. All that said, there ARE some episodes that are funny and entertaining, and some of the characters are GOLDEN (Miyano, Ecchan and Ohta). The art style isn't anything groundbreaking or particularly remarkable, but it accompanies the general atmosphere and feel of the story, and the coloring is really, really nice. The animation is okay most of the time. Just that. Okay. It gets below average, but never above. The sound is one of its best points, to me, since there are moments where really interesting things happen, diegetically. The opening song is really fitting. Tanaka-kun is Always Listless is a show I didn’t expect to like a lot. Initially, the show didn’t really click with me because it just felt so dull and boring. The refreshing art was the only redeeming factor I saw. I asked to myself, “How can a show about a listless individual be of any good?” I didn’t want to see every episode to be just Tanaka lazing around and ramble on how it feels nice to be listless. There must be more to the premise than this. But as a person who upholds the “no dropping” rule, I kept watching if it gets better or worse. A few episodes later, it ended up shattering my initial impression. I misinterpreted the premise of the show. It’s not about simply promoting listlessness, it’s about how others react to it. The main theme is listlessness and the show does a good job of revolving around that theme well. The show gives us situations that puts Tanaka’s listlessness to the test, and make other characters respond to it with such hilariousness and tact. As the show progressed, it kept introducing other characters that became vital in making the show charming. We start with the tall and reliable Ohta who likes sweet things, the hyper and cute Miyano who looks up to Tanaka as her master, the athletic tomboy Echizen who acts like a deliquent but loves cute things, the charming and responsible Shiraishi who everyone looks up to, and the list goes on. Truly, the strongest point of this show is character interaction and how their different personalities mingle in such a fun and amusing manner. The show really blends the comedy and slice-of-life elements well. It borrows conventional school tropes and clichés but with the listlessness twist that works really well. The laid-back atmosphere was initially too dull to be relaxing but the charming cast breathes life into it. The comedy is easy-going and relies on character reactions whenever an awkward situation happens. The reactions are not extremely exaggerated like in rapid slapstick comedies, they are timed pretty well and are given ample time for the audience to react as well. For example, the show usually starts its episodes with a short situational skit and when the awkward situation kicks in, the characters involved freezes for a while with their respective reactions. Just because they freeze up, doesn’t mean their surrounding does as well. You can still hear background noises and you can see the surroundings still moving despite the situation. Then about 5 seconds after the freeze, the opening sequence starts. The main protagonist Tanaka is a double-edged sword, he can either make the show better or worse. The show can’t stand on its own if it only focuses on Tanaka, giving less screen-time or even scrapping the other characters. Tanaka is uninspired and his listlessness delusions are absurd, but that is exactly why he works well when surrounded by a reoccurring cast that deals and reacts to his personality. The show is self-aware that listlessness has its problems but as long as you have someone to help you out then it becomes fine. What if Tanaka grows up to become an adult? Will his listlessness ruin his life? That leaves to another discussion, the show could have expanded on that aspect but that might ruin the show’s lighthearted charm by taking itself too seriously. Overall, the show is fun as a laid-back slice-of-life with a refreshing approach to comedy. Not everyone might find the show appealing due to its listlessness factor, but it’s definitely rewarding to those who just want to watch something relaxing yet hilarious during a chill evening. We've all felt it at one point during our lives; that lethargy that grips us and doesn't let go, leaving us in a bumbling state where our basic motor functions just don't want to cooperate. The very prospect of moving makes us groan, and every surface suddenly becomes a veritable pillow. Our thoughts drift off into space, and daydreams abound. Whether you're taken in the middle of a class, trying to be productive in an office, or are simply kicking back in the garden with a beverage in hand, a state of listlessness has surely came about at least once. It is the antithesis of productivity, yet one can do little in the face of it, for it laughs at those who try to escape its grasp, denying any and all attempts to break free. Once caught, the only course of action is to accept one's fate and go with the flow. 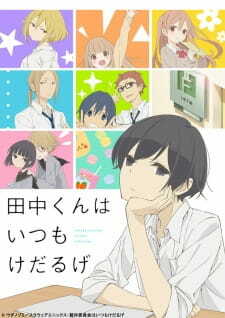 But it is that very state of listlessness that serves as the basis for this story, Tanaka-kun wa Itsumo Kedaruge (Tanaka-kun is always listless). The story is but a simple and modest one. It follows the life of teenage highschooler Tanaka, denoting his attempts at merely existing each day, and his interactions - or lack thereof - with those around him. Not much is ventured here; it is a barebones premise that, most surprisingly, ends up being highly entertaining because it leaves a lot of room for imagination and creativity. At first glance, it might seem somewhat uninteresting - after all, what enjoyment can be derived from a series where the main character can't be bothered to do anything? The answer to this rhetoric is a positive one - despite his unethused self, Tanaka manages to find himself in many a comedic situation brought about by his nature, in no small part thanks to his friends and compatriots. It is these very friends - and Tanaka included, of course - that enable this series to stand tall and blast away any doubts one might have about its apparent lacklustre premise. This series is a comedic one, mixing humour with a relaxing air to itself. It is like a constant, slow-burning candle; each episode moves along at its own pace, drawing you in, bringing many a chuckle and smile on the way. Not much happens in each episode, and yet not once does it feel like the 20 allocated minutes are being dragged out. They all centre around the highschool they go to, and so the accompanying events are naturally school-themed, such as participating in the culture festival, or having mishaps with misunderstanding classmates. However, unlike other school-themed comedy series such as Seitokai Yakuindomo or Nichijou, Tanaka-kun does not rely on sexual content and fanservice, or exaggerated ridiculousness. It is mundane to its core, but with a highly positive spin. Cast away your negative connotations of mundane events, because it brings these down-to-earth events to life in a most refreshing manner. For our main character Tanaka, listlessness is a perpetuity. For his own reasons, it is a state he cannot fight. It dominates his being, and is reflected in his every manner. He doesn't struggle against it - for that would contradict his very nature - but simply approaches life in the most easy and effortless way possible. Much to his chagrin, however, his days of school life are far from easy and effortless. He alleviates this by relying on his best friend Ohta, a man who can only be described as being the broest bro that ever broed. He is - in an almost literal sense - the backbone for Tanaka. He's there by Tanaka's side to help him through whatever each day throws at Tanaka, to the point where he even physically carries Tanaka to and fro wherever he needs to go. Yet not once does Ohta admonish Tanaka; he merely offers encouragement as he stoically goes about his duties. He's the ideal friend, one who accepts Tanaka for who he is and stays by him nonetheless. His abiltiies are such that even when shopping with Tanaka, Ohta attracts the attention of the ladies, resulting in their cries of "I want an Ohta too!" The dynamic duo aside, there are a handful of other characters who make up the main cast, each filtered into the story episode by episode. Miyano - affectionally dubbed Myaano by her senpai Echizen - is a go-getter who finds herself mesmerised by Tanaka. In an ironically contradictory and humorous manner, she tries her utmost to emulate Tanaka's actions, wanting to be carefree and listless in the same way he is. She's bright, enthusiastic and well-meaning, but also naive, evidenced by her ignorance towards her efforts to be effortless. The aforementioned Echizen is a girl from another class, who has a fierce and imposing exterior but is actually a kind maiden at heart; this juxtaposition serves as another point of comedy because she tries to act as a punk but can't truly deny her kind side. One can't help but smile when the terrifying senpai berates Tanaka and Ohta but then goes googly-eyed as she gushes over Myaano, the affectatious nickname she gifted upon Miyano. Shiraishi makes up for the 3rd main supporting character. She's the class-rep, who, unbeknownst to everyone else, has an identity crisis. At school, she's a bishoujo who has top grades, flawless looks and graces everyone else with her presence. Such is her stature that she has a group of followers akin to groupies who dog her around and accost any who would dare converse with their Queen. But when nobody is looking, she cuts loose, tying her hair up, slipping into casual and comfortable clothing and popping her nerdy looking glasses on. She has issues with her self because it's so different to her appearance at school; she isn't vain but merely tries to fit in. She also finds herself enamored with Tanaka, but in a romantic manner, as opposed to Miyano's inspired one. These 5 make up for the main cast, and it is their hijinks which are the source of the great entertainment Tanaka-kun wa Itsumo Kedaruge has to offer. They all interact with one another in different ways, bringing their own uniqueness to the table. The persiflage between Echizen and the rest keeps them on their toes; Myaano's adorableness mixes well with her go-getter mindset. Shiraishi finds solace in the group since they accept her for who she really is - even if that itself is based on a highly comedic misunderstanding. All three of them would appear as oil to Tanaka's water on the surface, but they flow together surprisingly well, and Tanaka is better off for them; he does occasionally try and make an effort for their sake. Where the art is concerned, it fits very well for the series' tone. The character designs are all fairly simple, without overly much detail to them, yet they still manage to capture each character and their personality, from Tanaka's large eyes which look dull and tired to Echizen's imposing and intimidating features which make her look like someone you shouldn't mess with. They all look distinct, and the colours are all light and cheery. It is a colourful series, one filled with brightness that lifts your spirits. It really shows that you don't need the intricate detail of Berserk or the gorgeous and endearing art that KyoAni is known for in order to bring characters to life. The listlessness of the series is perfectly encapsulated with simple designs and bright colours. I'll also add on a personal note that Shiraishi's design quickly became one of my favourites; there's just something about her that makes her stand out in my mind. With all that in mind, I can safely say that Tanaka-kun wa Itsumo Kedaruga is a series that subverted all of my initial expectations. I only picked this up in the first place because I like to watch the vast majority of seasonal anime. I really can't say that I was overly interested in it or had any high hopes for it to be decent. It seemed rather droll at the onset, but I can quite confidently say that this quickly became one of those anime that I was most looking forward to each week. It is a testament to the writing of the series that such an uninteresting premise could end up being so funny. It is entirely a character driven show, and it is those very same characters where this series shines. The cast is varied and all bring something different to the table. This is an anime to be put on after having a bad day, something where you can really relax and have a laugh all the way through. Stress is relieved by the smile that will inexorably find itself on your face.